Acero Precision manufactures pristine medical devices, instruments, and implants for several of its clients. In early November 2011, Acero received a special order from its client, Altus Spine and Dr. Charles Park, a neurosurgeon based out of Baltimore, Maryland. They asked Acero to donate several medical devices and instruments to Dr. Park’s annual mission trip to Albania. As in years past, Dr. Parks and his team of medical professionals offered care to local residents in poverty stricken areas. This year’s trip proved to be especially extraordinary. While spending time in Albania, the group expanded beyond the missions’ borders into Kosovo, a region more notably known for the Kosovo War in 1999. Since that time, much of the aid in the area was depleted. When the team arrived they were shocked to learn that its only national trauma center did not have the tools to treat simple fractures. Dr. 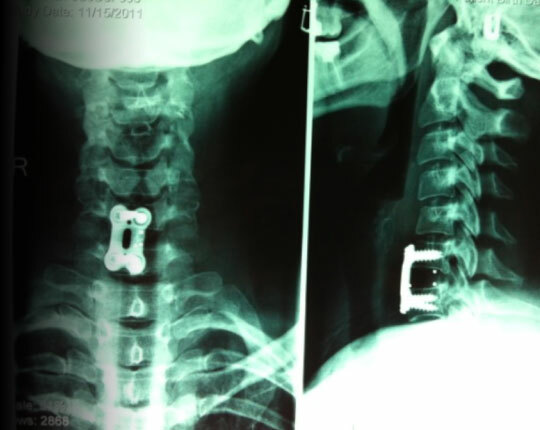 Parks used the donated Acero manufactured devices and systems in several surgical procedures, including the x-ray image showing an Acero made Cervical Plate System.